It is not easy to sum up—or celebrate—the career of a legend. Carnegie Mellon University’s Department of Statistics stepped up to the challenge recently when they honored Stephen E. Fienberg. Loosely dubbed “Steve-a-polooza,” the two-day event brought nearly 150 people to campus for a dinner and series of talks. "Steve is intensely dedicated to his work and focused on doing things the right way. He has an abiding passion for statistics as a discipline and its role as a force for good in the world. He is incredibly invested in guiding and supporting his students and generous with his time. He is a clear role model for how statisticians can make a difference," said Christopher R. Genovese, head of the Statistics Department. Fienberg’s CMU career began in 1980 when the late Morris H. (Morrie) DeGroot, founding head of CMU Statistics, recruited him to join Professors William Eddy, Joseph B. Kadane, John Lehoczky, Mark Schervish and a few others in the small department. Since then, Fienberg served as department head and dean of the College of Humanities and Social Sciences (now the Dietrich College), has joint appointments in the Machine Learning Department, Cylab and Heinz College and is one of the reasons the Statistics Department has top undergraduate and graduate programs. Fienberg’s involvement with national and international associations is quite impressive—and extends well-past being an elected member or fellow of top statistical and scientific organizations. For example, Fienberg, elected as a member of the National Academy of Sciences in 1999, has been deeply involved with the academy for over 40 years. He has served on 35 committees and panels addressing everything from bilingual education and census taking to research methodology and the accuracy of polygraph tests. And for the past 12 years, he has been part of the report review process, in which a team of up to 25 reviewers ensures that the results of a study are effectively and accurately communicated. Fienberg is responsible for reviewing 200 reports each year. He is currently serving on the Standing Committee of the American Opportunity Study, which aims to combine existing data from the U.S. census, surveys and programs like Social Security to study individuals and families over time. To cement his lasting imprint at CMU, the Statistics Department also launched the inaugural Fienberg lecture. Stephen Stigler, the Burton Distinguished Service Professor of Statistics at the University of Chicago, gave a talk on "Bayes, Price and Collegiality in Scientific Discourse." Fienberg was overwhelmed with the remarks given by CMU and other colleagues, friends, family members and former students. “The ability to take the broadest approach to what is considered to be statistics is what makes CMU's Statistics Department great, and there are very few places other than Carnegie Mellon where that could happen and thrive. It has been fantastic spending the past 36 years at CMU, working with so many terrific students, postdocs, faculty and staff,” Fienberg said. 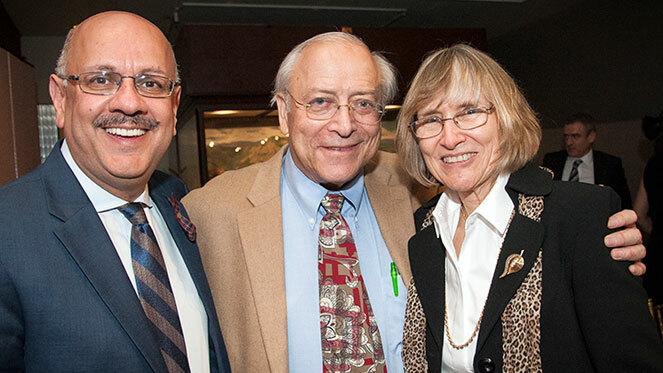 In the picture above, Stephen E. Fienberg (center) stands with his wife Joyce (right) and CMU Provost Farnam Jahanian at a dinner honoring him and his career.